The first morning of Nisaa's visit had us driving over to Hebron to pick up hay. You need to understand Nisaa and I too fully appreciate the dicotomay. It's not often folks like us get together to buy dead-bundled grass. Nisaa is my social opposite. A successful freelance businesswoman from Brooklyn. We became good friends in college and then our lives took us in different directions. Every once in a while we catch up with a weekend visit and this long holiday was a wonderful excuse to get together. The last time Nisaa came to Vermont I was working on planting my first raised-bed garden and had a handful of chickens in the coop. Her return a year later now had sixteen hooves, rabbits, and a gaggle of birds, and thirteen raised-beds now succumbing to weeds and pumpkins (but you could tell there was some glory there earlier in the season). Anyway, were were off to buy hay. As we rolled through the backroads from Sandgate to Hebron we talked about our weekend. We'd be going to a county fair that afternoon and Sunday morning a couple from the DC-area would be visiting for brunch. IN no time at all we came to the crest that shares the view of sprawling green fields, silos, and red barns. "Isn't that something else" she said to us both. It sure is. When we got to Nelson's farm, Nelson himself came out to greet us. I shouted if he had any second cut and he said he had plenty but pointed up to the high loft of the barn. I didn't realize his pointing wasn't so much an acknowledgment of the hay's existence as it was directions. 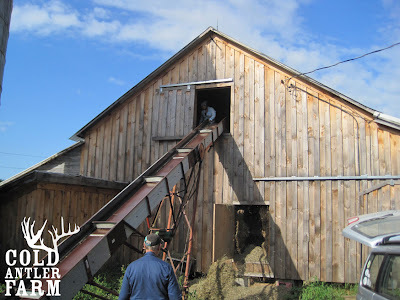 If I wanted the good stuff I had to climb up the hay elevator and throw some bales down. Apparently walking up several stories on old farm equipment was as casual an exercise and throwing down chicken scratch around here. I hesitated. I'm uncomfortable with heights. Nelson saw this and charitably started to grip the elevator to walk up the fifty-foot climb. That was unacceptable. (Nelson's about five decades older than me.) I sucked it up, grabbed the rails, hoped my wellies wouldn't slip, and started to climb up the narrow-metal shaft. It was fine. I got up in no time and threw down the bales and then slid down slide style back to terra firma. While I was up there on top of Washington County, Nisaa grabbed that photo of me looking for the next thing to chuck out the window. When I got back to my car I handed Nelson the check and we drove off back to our further adventures. But I drove home feeling like I earned a little more street-cred. If there was such a thing as shepherd merit badges I just sewed one on with a hay elevator on it. Good for you Jenna. How did you friend liker her visit? I always love having city friends over. we're grabbing her train in about an hour. I think she had a good time! Thats great. Glad she enjoyed her visit. Safe travels on her way home. Courage is facing the fear and moving forward anyway. You definitely earned cred and a badge, girl! Loved your book. Love your blog. Thank you. 50 feet up is too high for me....I bet Nisaa was impressed with you and so was Nelson. Do you sometimes go into the city to see you friend? Do you get homesick--for Vermont OR for the city? I haven't been to NYV in about four years. Was in LA and Boston last year. Cities are a vacation destination for me, a way to relax. Everything is pre-made and waiting for you: food, entertainment, museums, parks. It's less feral. But now I go when I have too, to be perfectly honest. I don't miss them. I like making my own food, entertainment, parks and musuems right here. I had to climb an even higher elevator to reach our haymow when growing up on the farm. The first time was scary, by the end of the summer I was running up and down like the crazy kid that I was. Farmers tend to have to step out of their comfort zone quite often, you'll get used to it.